For anyone who has suffered, their family and friends, and other helping professionals, this book should be by your side. 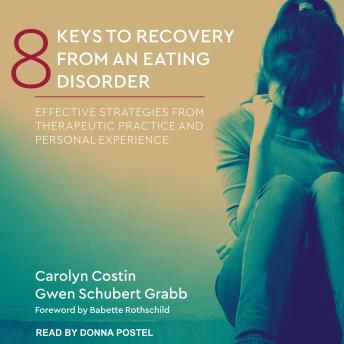 With great compassion and clinical expertise, Carolyn Costin and Gwen Schubert Grabb walk listeners through the ins and outs of the recovery process, describing what therapy entails, clarifying the common associated emotions such as fear, guilt, and shame, and, most of all, providing motivation to seek help if you have been discouraged, resistant, or afraid. The authors bring self-disclosure to a level not yet seen in an eating disorder book and offer hope that full recovery is possible.